GAMALIEL AND HIS PRUDENT ADVICE. WE have set forth in these verses an incident in the second appearance before the council of the Apostle Peter and the other Apostles, conspicuous among whom must have been James the brother of John. It is almost certain that James the son of Zebedee was at this time very prominent in the public work of the Church, for we are told in the opening of the twelfth chapter that when Herod would vex and harass and specially weaken the Church, it was neither Peter nor John he first arrested, but he laid hands on James, and placed on him the honour of being the earliest martyr from amongst the sacred band of the Apostles. Peter we may, however, be sure was the centre of Sadducean hate at this, period, and one of the most conspicuous members of the Church. We should at the same time beware of exaggeration, and strive to estimate the events of these earliest days of the Church, not as we behold them now, but as they must have then appeared unto the members of the Sanhedrin. The deaths of Ananias and Sapphira seem now to us extraordinary and awe-inspiring, and sufficient to strike terror into the hearts of all unbelievers; but probably the story of them had never reached the ears of the authorities. Human life was but little accounted of among the Romans who ruled Palestine. A. Roman master might slay or torture his slaves just as he pleased; and the Romans, scorning the Jews as a conquered race, would trouble themselves but little concerning quarrels or deaths among them, so long as public order and the stated business of society were not interfered with. The public miracles which St. Peter wrought, these were the things which brought matters to a crisis, and called afresh the attention of the Sanhedrin, charged as they were with all religious authority, as the miracle of healing wrought upon the impotent man had led to the arrest of the Apostles on a previous occasion.107 It is a mistake often made, in studying the history of the past, to imagine that events which we now see to have been important and epoch-making must have been so regarded by persons living at the time when they happened. Men are never worse judges of the true value of current history than when they are placed in the midst of it. It is always the on-lookers who see most of the play. Our minds are so limited, our thoughts are so completely filled up with the present, that it is not till we have got away from the events, and can view them in their due proportion and symmetry, surrounded with all their circumstances, that we can hope to form a just appreciation of their relative importance. I have often seen a. hill of a few hundred feet in height occupying a far more commanding position in men’s eyes than a really lofty mountain, simply because the one was near, the other far off. The deaths of Ananias and Sapphira are recorded therefore at full length, because they bring eternal lessons of justice, judgment, and truth along with them, The numerous public miracles wrought by Peter when "multitudes came together from the cities round about Jerusalem, bringing sick folk and them that were vexed with unclean spirits, and they were healed every one," seemed to the Sanhedrin and the religious public of Jerusalem the all-important topics, though they are passed wholly over in the Scriptures as matters of no spiritual interest. If it requires a vast exercise of patience and wisdom to estimate events aright in their mere worldly aspect, it requires the operation and guidance of the Holy Ghost to form a sound judgment upon the relative spiritual value of events falling within the sphere of Church history; and there indeed it is most true that matters which seem all-important and striking to man are judged by God as insignificant and unworthy of notice. So contradictory are ofttimes the ways of God and the opinions of man. The public miracles wrought by St. Peter had this effect, -the only one noted at length by the sacred writer: they led to the fresh arrest of Peter and the other Apostles by the High Priest and the sect of the Sadducees, and to their incarceration in the public prison attached to the temple. Thence they were delivered by an angel and sent to speak publicly in the temple, where their adversaries officially assembled; just as on a later occasion Peter, when imprisoned by himself, was released by angelic interference. Men looking back upon the history of the primitive Church, and judging of it as if it were the history of an ordinary time and age, have objected to the angelic interventions narrated here and in a few other places in the New Testament. They object because they do not realise the circumstances of the time. Dr. Jortin was a shrewd writer of the last century, now too much neglected. He remarked in one place that, suppose we admit that a special revelation of the good powers of the heavenly world was made in Christ, it was natural and fair that a special manifestation of the powers of evil should have been permitted at the time of Christ’s Incarnation, in order that the triumph of good might be the greater; and thus we would account for the diabolical possessions which play such an important part in the New Testament. The principle thus laid down extends much farther indeed. The great miracle of the Incarnation, the great manifestation of God in Christ, naturally brought with it lesser heavenly manifestations in its train. The Incarnation raises for a believer the whole level of the age when it occurred, and makes it an exceptional time. The eternal gates were for a moment lifted up, and angels went in and out for a little; and therefore we accept without endeavouring to explain the words of the narrative which tells us that an angel opened the prison doors for the Apostles, bidding them go and speak in the temple all the words of this life. And then from the temple, where they were teaching early in the morning, about daybreak of the day following their arrest, they are led by the officers before the Sanhedrin which was sitting in the city. Here let us pause to note the marvellous accuracy of detail in St. Luke’s narrative. The Sanhedrin used to sit in the temple, but, a few years before the period at which we have arrived, four or five at most, they removed from the temple into the city, a fact which is just hinted at in the fifth verse of the fourth chapter, where we are told that the rulers, and elders, and scribes were gathered together in Jerusalem, that is, in the city, not in the temple; while again in this passage we read that when the High Priest came and convened the council and all the senate of the children of Israel, they sent their officers to bring the prisoners before them. These officers after a while returned with the information that the Apostles were preaching in the temple. If the Sanhedrin were meeting in the temple, they would doubtless have learned this fact as soon as they assembled, especially as they did not sit till after the morning sacrifice, several hours after the Apostles appeared in the temple.108 When brought before the council the Apostles boldly proclaimed their intention to disregard all human threats, and persevere in preaching the death and resurrection of Christ. The majority would then have proceeded to extreme measures against the Apostles, and in doing so would only have acted after their usual manner. The greater part of the Sanhedrin were Sadducees, and they, as Josephus tells us, were men of a bloodthirsty character, ever ready to proceed to punish in the most cruel manner. The simple fact is this, the Sadducees were materialists. They looked upon man as a mere animated machine, and therefore, like the pagans of the same period, they were utterly regardless of human sufferings, or of the value of human life. We little recognise, reared up as we have been in an atmosphere saturated with Christian principles, how much of our merciful spirit, of our tender care for human suffering, of our reverent respect for human life, is owing to the spiritual ideas of the New Testament, teaching as it does the awful importance of time, the sanctity of the body, and the tremendous issues which depend upon life. Sadducees and pagans knew nothing of these things, because they knew nothing of the inestimable treasure lodged in every human form. Life and time would have been very different for mankind had not the spiritual principles inculcated by Pharisee and by Christian Mike triumphed over the cold stern creed which strove on this occasion to stifle the religion of the Cross in its very infancy. When the Sadducees would have adopted extreme measures, the words of one man restrained them and saved the Apostles, and that one man was Gamaliel, whose name and career will again come before us. Now let us apply ourselves to the consideration of his address to the Sanhedrim Gamaliel saw that the large public gathering to whom he was speaking were thoroughly excited and full of cruel purposes. He therefore, like a true orator, adopts the historical method as the fittest one for dealing with them. He points out how other pretenders had arisen, trading on the Messianic expectations which then existed all over Palestine, and specially in Galilee, and how they had been all destroyed without any action on the part of the Sanhedrim He instances two cases: Judas, who lived in the days of Cyrenius and the taxing under Augustus Caesar; and Theudas, who some time previous to that event had arisen, working upon the religious and national hopes of the Jews, as the persons now accused before them seemed also to be doing. He points to the fate of the pretenders he had mentioned, and advises the Sanhedrin to leave the Apostles to the same test of Divine Providence, confident that if mere impostors, like the others, they will meet with the same death at the hands of the Romans, without any interference on their part. Let us now turn from the purely historical side of Gamaliel’s speech, and view it from a spiritual standpoint. The address of Gamaliel was so favourable to the Apostles that it has helped to surround his name and memory with much legendary lore. It was the tradition of the ancient Greek Church from the fifth century that he was converted to Christianity and baptised, along with his son Abibus and Nicodemus, by St. Peter and St. John.112 The story of Gamaliel’s secret adherence to Christianity goes even much farther back. There is a curious Christian novel or romance, which dates back to close upon the year 200, called the "Clementine Recognitions." We find the same tradition in the sixty-fifth chapter of the first book of these "Recognitions. "113 But the sacred narrative itself gives us no hint of all this, contenting itself with setting forth the prudent advice which Gamaliel gave to the assembled council. It was wise advice, and well would it have been for the world if influential religious and political teachers in all ages had given similar counsel. Gamaliel was a man of large scholarship, combined with a wide mind, but he had learned that time is a great solvent, and the greatest of tests. Beneath its influence the most pretentious schemes, the most promising of structures, fade away if built upon the sand of human wisdom, while opposition only tends to consolidate and develop those that are built upon the foundation of Divine strength and power. The policy of patience recommended by Gamaliel is a wise one, either for the Church or for the state, in things spiritual and things secular alike. And yet it is one from which the natural man recoils with an instinctive repugnance. It speaks well for the Jewish Sanhedrin that on this occasion they yielded accord to the advice of their president. We are glad to recognise this spirit in these men, where we so often have to find matter for blame. Well would it have been for the Church and for the credit of Christianity had the spirit which moved even the Sadducean majority in the Jewish council been allowed to prevail; and yet how little have the men of tolerant mind been regarded in moments of temporary triumph such as the Sanhedrin just then enjoyed. Gamaliel’s advice, "Refrain from these men and let them alone. If the work be of man it will be overthrown; if of God, ye will not be able to overthrow them," strikes a blow at the policy of persecution, which is essentially a policy of impatience. The intolerant man is an impatient man, not willing to imitate the Divine gentleness and long-suffering, which waits, endures, and bears with the sins and ignorance of the children of men. And the Church of Christ, when she became intolerant, as she did as soon as ever Constantine placed within her reach the sword of human power, forgot the lesson of the Divine patience, and reaped within herself, in a shallow religion, in a poorer life, in a restrained intellectual and spiritual grasp, the due reward of those who had fallen away from an imitation of the Divine example to a mere human level. It is sad to see, for instance, in the case of a man so thoroughly spiritual as St. Augustine was, how easily he fell into this human infirmity, how quickly he became intolerant when the secular arm was ranged on the side of his own opinions. The Church in his own boyhood, during the days of Julian, had to strive against the intolerance of the pagans; the orthodox, who upheld the Catholic view of the nature of the Godhead and the scriptural doctrine of the Holy Trinity, had to struggle against the intolerance of the Arians. Yet as soon as power was placed in St. Augustine’s own hand he thought it right to exercise compulsion against those who differed from him. It was exactly the same in later days. Men may take up commentators of the sixteenth and seventeenth centuries, Protestant and Roman Catholic alike. There they will find many remarks, acute, devout, heart-searching, but very few of them will be found to have arrived at the mental fairness and balance involved in those words, "Refrain from these men, and let them alone." Cornelius a Lapide was a Jesuit commentator of those times. 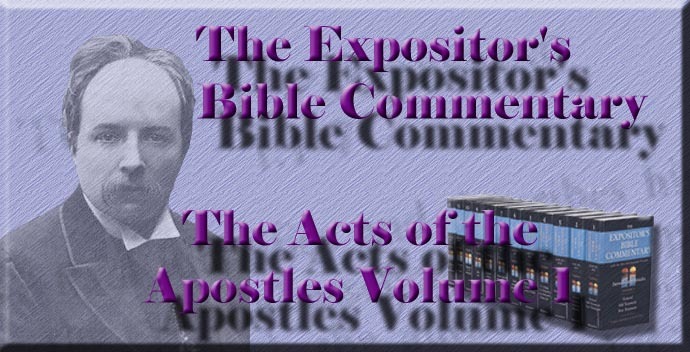 He wrote many valuable expositions of Holy Scripture, including one dealing with this book of the Acts, filled with thoughts suggesting and stimulating. It is, however, almost ludicrous to notice how he strives to evade the force of Gamaliel’s words, and to escape the application of them to his own Protestant opponents. The Sanhedrin were quite right, he thinks, in adopting Gamaliel’s advice, and in showing themselves tolerant of the apostolic preaching because the Apostles worked miracles; and so, though they were unconvinced, still they had just reason to suspend their judgment. But as for the Protestants of his time, they were heretics; they were the opponents of the Church, the bride of Christ, and therefore Gamaliel’s words had no application to them; as if the very question that was raised by the Protestants was not this—whether Cornelius a Lapide himself and. his Jesuit brethren did not represent Antichrist, and whether the Protestants were not the true Church of God, who therefore on his own principles were quite justified in persecuting their Romish opponents. It is very difficult to get men to acknowledge their own fallibility. Every party, when triumphant, believes that it has a monopoly of truth, and has a Divine right of persecution; and every party when downcast and m adversity sees and admires the beauties of toleration. Verily, societies, churches, families, as well as individuals, have good right diligently to pray, "In all time of our wealth, good Lord, deliver us," for never are men in greater spiritual danger than when prosperity leads them to vote themselves infallible, and to practise intolerance towards their fellow-men on account of their intellectual or religious opinions. The sentiment of Gamaliel on this occasion may, however, be pushed to a mischievous extreme. He advised the Sanhedrin to exercise patience and self-control, but he did not apparently go any farther. He did not recommend them to adopt the noblest course, which would have been unprejudiced examination into the claims put forward by the Christian teachers. Gamaliel’s advice was good, it was perhaps the best he could have given, or at least which could have been expected under the circumstances, but it was not the highest or noblest conceivable. It was the kind of advice always given by men who do not wish to commit themselves untimely, but who are waiters upon Providence, postponing their decision ‘as to which side they shall join until they first see which side will win. Opportunists, the French call them; men who are sitting upon the fence, we in homelier phrase designate them. It is well to be prudent in our actions, because true prudence is only Christian wisdom, and such wisdom will always lead us to take the most effectual ways of doing good. But then prudence may be pushed to the extreme of moral cowardice, or at least the name of prudence may be used as a cloak for a contemptible desire to stand well with all parties, and thereby advance our own selfish interests. Prudence should be united with moral courage; it should be ready to take the unpopular side, and to champion truth and righteousness even when in a depressed and lowly condition. It was easy enough to side with Christ when the multitude cried, "Hosanna in the Highest." But the test of deepest love and unfailing devotion was—when the women stood by the cross, and when the Magdalen sought out the grave in the garden that she might anoint the dead body of her loved Lord. Finally, let us just notice the conduct of the Apostles under those circumstances. The Apostles were freed from the pressing danger of death, but they did not entirely escape. The Sanhedrin were logically inconsistent. They refrained from putting the Apostles to death, as Gamaliel advised, but they flogged them as Roman laws permitted; and a Jewish disciplinary flogging, when forty stripes save one were inflicted, was. so severe that death sometimes resulted from it.114 Man is a curiously inconsistent being, and the Sanhedrin showed on this occasion that they had their own share of this weakness. Gamaliel advised not to kill the Apostles, but let time work out the Divine purposes either of success or failure. They adopt the first part of his advice, but are not willing to allow Providence to develop His designs without their interference, and so by their stripes endeavour to secure that failure shall attend the apostolic efforts. But it was all in vain. The Apostles were living under a realised sense of heavenly things. The love of Christ, and communion with Christ and the Spirit of Christ, so raised them above all earthly surroundings that what things seemed toss and shame and grief to others were by them counted highest joy, because they looked at them from the side of God and eternity. Human threats availed nothing with men animated by such a spirit, -nay, rather as proofs of the opposition of the evil one, they only quickened their zeal, so that "every day, in the temple and at home, they ceased not to teach and to preach Jesus as the Christ." How wondrously, life would be transformed for us all did we view its changes and chances, its sorrows and its pains, as the Apostles regarded them. Poverty and disgrace, undeserved loss and suffering, all alike would be transfigured into surpassing glory when endured for Christ’s sake, while our powers of labour and work, and our active zeal in the holiest of causes, would be quickened, because, like them, we should walk and live and toil in the loved presence of One who is invisible. Acts v. 12-16 states that St. Peter wrought many miracles, and further that men sought to place their sick in such a position that even his shadow might fall upon them, thinking that it brought healing with it. This statement has been spoken of as a demonstrative proof of legendary growth by Zeller in his work on the Acts, and is weakly apologised for by Meyer. But the analogy of hypnotism at the present time, when cures are wrought and extraordinary influence exercised without corporeal contact, is quite sufficient to vindicate St. Luke's account from the charge of legend. If moderns can produce marvellous results without immediate touch; if, for instance, hypnotised patients when blindfolded can read a book by means of their stomachs or their noses (Moll, p. 366, already quoted), or blisters can be raised by a piece of white paper merely by suggestion, as stated by Moll, pp. 114-22, surely the statement of St. Luke is no necessary proof of legend and old wives' fables. See my remarks on p. 100 above. See Dr. John Lightfoot, Horæ Hebraicæ , on the Acts, iv. 5. Cf. his remarks on St. Mark xv. 1, where that learned Hebraist seems to support this view, though admitting that there is something to be said on the other side, viz., that the council met in the temple as of old. See, for instance, Zeller on the Acts of the Apostles, vol. i., p. 228 (Norgate and Williams: London, 1875), where he says: "We must therefore maintain the possibility that our author, after the fashion of ancient historians, freely invented Gamaliel's speech; and it is a question how much of it belongs to history at all, and especially whether Gamaliel delivered the discourse in favour of the Christian cause;" with which statement the whole context, pp. 223-32, should be compared. The report of Gamaliel's speech is due of course to St. Paul, who was doubtless present during its delivery. The family of Gamaliel himself illustrates the principle for which we are contending, viz., that families have a tendency to reproduce exactly the same political and religious tendencies. Gamaliel himself was grandson of the Jewish patriarch Hillel I., who presided over the Sanhedrin long before the Christian era. Gamaliel's grandson, Gamaliel II., was president of the Sanhedrin during the first twenty years of the second century. He was distinguished by the same liberal principles as characterised his grandfather. Gamaliel II. was succeeded by his son Simon. So that the presidency of the Sanhedrin continued in the same family for nearly two centuries. It is a notable fact, and not without its bearing on some modern controversies, that the Jewish canon of the Old Testament was not finally closed till the time of the presidency of Gamaliel II., that is, about the year 117 A.D. "Up to this time the members of the Sanhedrin themselves, in whom was vested the power to fix the canon, disputed the canonicity of certain portions of the Hebrew Scriptures. Thus the school of Shammai excluded Ecclesiastes and the Canticles from the text of Holy Writ, declaring that they proceeded from Solomon's uninspired wisdom. It was the Sanhedrin at Zabne which decided that these books are inspired, and that they form part of the canon. "—See Mr. Ginsburg's article on Gamaliel II. in the Dictionary of Christian Biography , vol. ii., p. 607. Upon the question of the historical accuracy of the Acts of the Apostles, the appendix to the late Bishop Lightfoot's collected essays on Supernatural Religion (London, 1889) should be consulted. The opening paragraph bears directly upon our point. "In a former volume M. Renan declared his opinion that the author of the third Gospel and the Acts was verily and indeed ( bien réellement ) a disciple of St. Paul.... Such an expression of opinion, proceeding from a not too conservative critic, is significant; and this view of the authorship, I cannot doubt, will be the final verdict of the future, as it has been the unbroken tradition of the past. But at a time when attacks on the genuineness of the work have been renewed, it may not be out of place to call attention to some illustrations of the narrative which recent discoveries have brought to light. No ancient work affords so many tests of veracity, for no other has such numerous points of contact in all directions with contemporary history, politics, topography, whether Jewish, or Greek, or Roman." We learn this from the Bibliotheca of Photius, Cod. 171. Photius was a very learned Greek patriarch of the ninth century. He was a diligent student, and made an analysis of every book he read. These extracts have been gathered into one volume called his Bibliotheca or Library , and can now be consulted in any collection of the Greek fathers. Photius reports his story about Gamaliel and Nicodemus from two earlier writers, Chrysippus and Lucian, presbyters of Jerusalem. For an account of the Clementine Recognitions see Dr. Salmon's Introduction to the N. T., 4th ed., pp. 14-19, 373-75. Translations, both of the Recognitions and Homilies , can be consulted in Clark's Ante-Nicene Library. St. Paul, as he tells us in 2 Cor. xi. 24, was five times flogged by the Jews. When the Jews inflicted this punishment the culprit was tied to a pillar in the synagogue; the executioner, armed with a scourge of three distinct lashes, inflicted the punishment; while an official standing by read selected portions of the law between each stroke. Thirteen strokes of the threefold scourge was equivalent to the thirty-nine stripes. This was the flogging the Apostles suffered on this occasion.